Captured by the US 82nd Airborne in the early hours of D-Day, Sainte-Mère-Église would become the first town in France to be liberated by the Allies. The small town of Sainte-Mère-Église, at the foot of the Cotentin peninsula, is just five miles inland from Utah Beach, the most westerly of the five assault beaches for D-Day and critical to the Allies’ right flank. The town lay beside the main highway from Paris that ran north from Carentan to the port of Cherbourg, and which provided a vital link to any German forces engaged in the defence of the area. Vital to ensuring a successful landing on Utah, the task of securing the town and road together with the nearby railway line and bridges over the River Merderet, was given to one of the best units in the US Army – the battle-hardened paratroopers of the 82nd Airborne Division. In the early hours of 6 June 1944, after a widely scattered drop, some in the Division’s 505th PIR found themselves landing right in the heart of the town, caught in the glowing light cast by a burning building. With the white silk of their parachutes clearly visible, many of the men hanging defencelessly beneath them were easy targets. The casualty rate was high but, after regrouping with other units, the men of the 82nd attacked in a ferocious assault and a fierce firefight with the German defenders soon erupted. By dawn it was over and with the capture of the town the Stars and Stripes now flew over Sainte-Mère-Église. 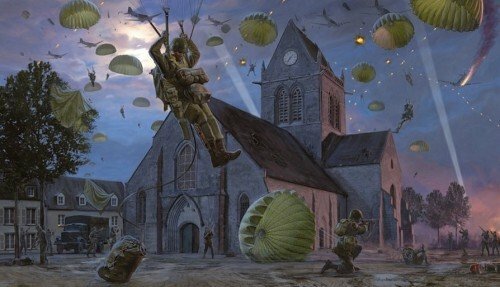 The scene is superbly illustrated in Simon Smith’s dramatic piece, Sainte-Mère-Église, and the prints in this moving limited edition have been individually signed by two 82nd Airborne veterans who took part in the capture of the town, guaranteeing a lasting link to this famous episode in history. The name ‘Sainte-Mère-Église’ will be forever associated with the highest levels of bravery shown by the airborne forces in World War II, and this historic edition represents a lasting tribute to them. THE SIGNATURES Joining artist Simon Smith in individually signing each print in the limited edition are two veterans who fought with 82nd Airborne at Sainte-Mère-Église. Captain DEAN McCANDLESS Serving with the 1st Battalion, 505th PIR, 82nd Airborne he had already made the first of his four combat jumps in July 1943 at Sicily during Operation Husky, followed by Salerno, before jumping on D-Day. Landing on the outskirts of Sainte-Mère-Église he and his unit fought an intense firefight to successfully to capture the bridge over the Merderet River. After Normandy his fourth jump was during Operation Market Garden before moving on to fight throughout the Battle of the Bulge where he was wounded. He was awarded the Silver Star and Purple Heart. Staff Sergeant LEO A. DUMOUCHELLE Serving with the 82nd Airborne Division, 307th Airborne Engineer Battalion, he had already jumped at Sicily and Salerno before undertaking his third combat jump into Normandy on D-Day into Sainte-Mère-Église. After jumping on Operation Market Garden he was wounded in Belgium in September 1944 but returned to his unit to fight during the Battle of the Bulge. He was awarded the Bronze Star and Purple Heart. Private 1st Class ARTHUR ‘ART’ PETERSEN Fox Company 2nd Battalion, 506th PIR, 101st Airborne Division Landing near Sainte-Mère-Église on D-Day, he fought at Angoville-au-Plain and Carentan. He also jumped on Operation Market Garden and fought at Bastogne in the Battle of the Bulge. Each unique drawing is conservation matted to include the original pencil signatures of a further two veterans who served with the famous ‘Band of Brothers’, Easy Company, 101st Airborne. Private 1st Class BILL WINGETT Easy Company, 2nd Battalion, 506th PIR Also serving with Headquarters Company, he jumped on both D-Day and Operation Market Garden fighting with the unit in Bastogne. Colonel ED SHAMES Easy Company, 2nd Battalion, 506th PIR After jumping on D-Day with Item Company he moved to Easy Company for Operation Market Garden, and fought at Bastogne during the Battle of the Bulge. Each Giclée is printed directly on to fine canvas using the most sophisticated digital technology and is supplied pre-stretched ready to simply drop into a frame of your choice.